I've been seeing lots of peppermint candy inspired crafts everywhere this year. Nothing says Christmas like red & white peppermint candy canes! When I saw Liz's Peppermint X-mas Cushion on her blog 'Howling at the Mooon' I really wanted to make one. 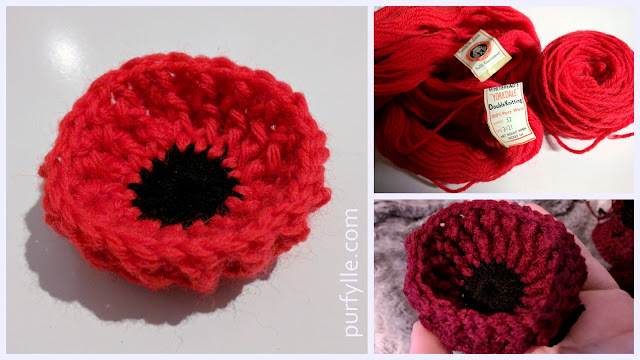 I didn't have any appropriate yarn so I pinned it to my Pinterest Crochet board for when I did have yarn. 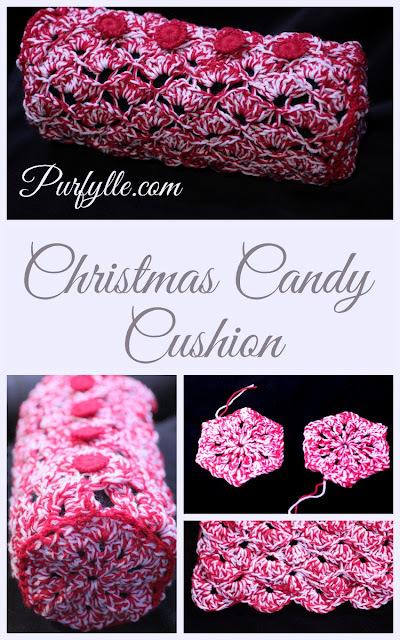 When I saw this awesome Candy Cane Ripple Scarf and Peppermint Candy Hat pattern over at 2 Crochet Hooks I really, really, really wanted to join in on the peppermint candy fun. That Candy Hat has been added to my to-make list too. Then my brain finally remembered that I have a UFO, it's not stripes but it is red and white! A UFO that was really a failed and discarded afghan attempt from last year. And now I knew what to do with it! The shell pattern is from An Encyclopedia of Needlework. It just had to be turned into a cushion. I wanted it to be a little different so I made up some hexagon ends using the hexagon pattern from Meet Me At Mikes. I did make a small change and used trebles instead double trebles. I realised the cushion cover would need a closure so I made these cute little buttons from Sheruknitting although they refused to have a nice photo taken. I still need to stitch the buttons on properly, but I couldn't wait to show you. Until I get those buttons stitched on (hopefully later tonight) it's technically still a WIP but at least its been upgraded from UFO. That's a win in my book. Good luck with your holiday crafting projects! I'll see you over at How to Get Organised at Home in the new year. How exciting! It's the first time I've had a post featured, Thank you very much! What fun projects!! I'd love it if you shared this post on the Pleasures of the NWs DIY party!! Thanks for the invite. I hope I haven't missed the party. Cute pillow! And it really does make me think of Christmas candy canes or peppermints! Yum! 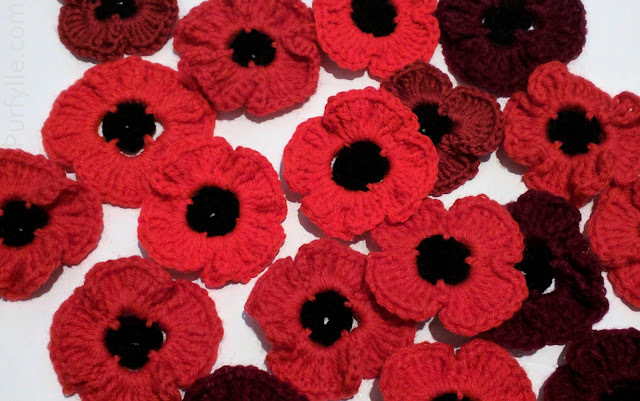 So creative and cute pattern you used for it and I love your little buttons you made too!